She’s America’s favorite girlfriend. A trusted source of news, information and trends. A global style star and “travelista”, Adai Lamar jets across the globe to review fabulous travel destinations and discover fashion treasures for her growing community of adventurists. A girly girl with a healthy dose of daredevil, you will find Adai rock climbing, swimming with sharks, joy riding on an ATV, stock car racing and digging in her heels (stilettos please) to any given athletic challenge. Adai uses her voice to champion for the community she serves as well as the her. She is the Health Ambassador for KJLH. 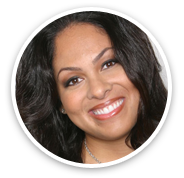 She is the radiant face and voice of KJLH’s Annual Women’s Health Forum. Adai Lamar has been instrumental in bringing over 10-thousand women of all ages together annually to be educated on how to live healthier lifestyles. Doctors and medical experts from around the world reach out to be a panelist on her two-hour broadcast that starts the all day forum at the LA Convention Center. Adai is an advocate for a lifestyle of fitness. She encourages her listeners to be the healthiest versions of themselves. She teamed up with CJ of CJ’s Functional Fitness to be apart of the Fitness Syndicate Show. Adai believes an active life sustains the best quality of life. Her credo. “See Something Amazing. Do Something Amazing. Wear Something Amazing.” Adai has a healthy zeal for discovery that is contagious. She scopes out well known travel destinations as well as hidden treasures for people who love to “go”. A afficianado of all things fashion, Adai celebrates the artistry and beauty of clothes from haute couture to athleisure. Her juicy secret? A torrid, insatiable lust for shoes. And whenever she travels South Africa, Mexico, France, Adai reveals the coolest bars, restaurants, attractions and natural beauty experiences for her fans to check out on their next travel excursion. A veteran in urban radio, Adai wakes more than a million Los Angeles listeners every weekday morning, 6am-10am as the local voice for the Steve Harvey Morning Show on 102.3 KJLH radio station, owned by Stevie Wonder. Trusted for her community outreach and keeping listeners “in the know”, Adai boasts more than a decade of broadcast experience. A trailblazer, she is the first African American woman to lead a Los Angeles morning radio show and is a noted community champion for a host of important causes including: Jenesee Center, Ronald McDonald House, Boys & Girls Club, AARP, Susan G. Komen and Los Angeles Job Corp. Follow Adai on Twitter and Instagram @adailamar, like her on Facebook @adailamar1. And post your thoughts, fashion finds, travel discoveries and community questions on adailamar.com.